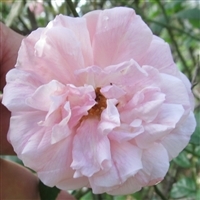 Darlow's Enigma is a found rose discovered in 1993. Described by Modern Roses 12 as having an intense sweet honey fragrance. It sends out large clusters of white blooms with yellow stamens. Shade tolerant. Hawkeye Belle is a 1975 introduction by Dr. Griffith J. Buck. The blooms are large, 4-4 1/2". This variety is known for the dense bushy growth. Originating some time before 1891 and named for the mother of President Washington. An 1845 introduction from France, the flowers are white to the outside gaining a salmon pink towards the center, good repeat. Compact in growth. Discovered in 1922, a sport of Mrs Herbert Stevens, this rose has pure white flowers with a tea fragrance. Out of the United Kingdom in 1919, this variety likes to bloom in clusters. The time between flushes is short. Glossy dark leaves. R. moschata is a species rose with a Musk fragrance. 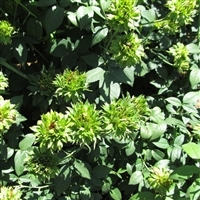 This plant may be grown as a shrub or climber. The blooms open in clusters throughout the growing season.